NOTES: Eduard photoetch instrument panel and seatbelts, Xtradecal 32-020, and Victory Models “Spitfire: Aces of the Empire,” used. The introduction of the Focke-Wulf Fw-190 in the fall of 1941 put the RAF in a fix. While RAF intelligence tried at first to convince pilots of Spitfire Vs who were fighting for their lives over northern France against the newly-arrived mystery ship that the Luftwaffe was using ex-French Hawk 75s, the pilots weren’t buying it. As Johnny Johnson said, “no pre-war type ever performed like the Fw-190.” The Fw-190 outperformed the Spitfire V in all maneuvers other than turning radius, and as Al Deere said, “turning doesn’t win battles.” As the Focke-Wulf fighter equipped all three Geschwader of both JG2 and JG26 - the Luftwaffe’s fighter force on the Channel Front - RAF losses among Spitfire squadrons were reminiscent of RFC losses during “Bloody April” of 1917. When a German pilot accidentally landed his brand-new Fw-190A-3 at RAF Pembrey in May of 1942, insult was added to injury when it was discovered that the Luftwaffe had derated the BMW801 engine from 1,850 h.p. to around 1,600 h.p. to preserve engine life, and it still out-performed everything the RAF had. The cry went out for a Spitfire that could equal the new menace. Supermarine was already planning production of the Spitfire VIII, which was to be powered by the Merlin-60 series of engines, with a two-stage supercharger, providing performance that promised to meet the challenge of the big bad Wulf. The problem was, Supermarine was trying to do it right, with a beefed-up airframe to take maximum advantage of the increased power, and the best estimate was that the new model Spitfire wouldn’t be ready before early 1943. Time was now of the essence if Fighter Command was not to give up the advantage won over northern France at such high cost. The Spitfire IX began life as an “interim” development of the Spitfire V - which itself was an interim development from the Spitfire I - and entered production in the late Spring of 1942. Testing the new Spitfire against the “tame” Fw-190 revealed that the performance advantage provided was only in certain performance regimes at certain altitudes, but even where it came in second to the Wurger, it was a very close second. With production only beginning to gear up, only a few squadrons were initially able to turn in their Spitfire Vs for the new “long nose” Spitfire until the summer of 1943. Provision of the Spitfire IX to Fighter Command squadrons for the first year of production was based on a squadron “winning” the right to receive the new Spitfire based on their performance. By the Spring of 1943, the Spitfire IX had given the RAF back equality of equipment vis-a-vis the two elite Luftwaffe Geschwadern on the Channel Front, while increasing numbers eventually provided air superiority. Interestingly, the Spitfire V, which was an interim type produced from the Mark I airframe, and the Spitfire IX, an interim type produced from the Spitfire V, accounted for more than half of all Spitfires produced during the Second World War, with the Spitfire IX beating out its progenitor by a nose to become the most-produced Spitfire sub-variant. 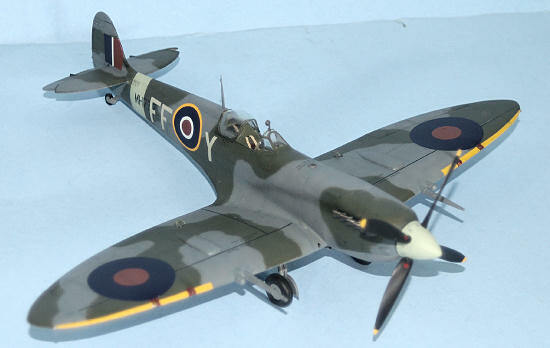 When Tamiya announced their big Spitfire IX in 2009, modelers were ga-ga over the possibilities. After the kit was released in December 2009, it was quickly hailed as a “game changer” that set the bar higher than ever before for detail and quality of design and production. In the box, the kit is either an early or late production Spitfire IXc, providing options for the different carburetor air intake and different elevators associated with these slightly-differing sub-types. The kit provides separate control surfaces throughout for the modeler who wants to pose them in a “dynamic” setting. 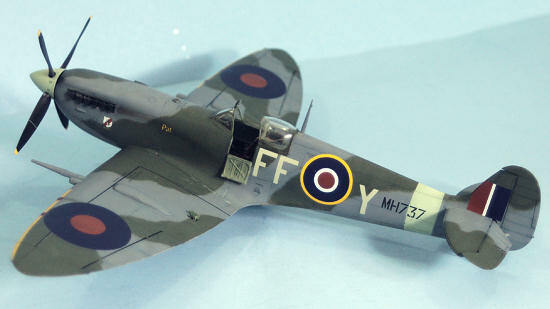 Fortunately - since most models nowadays that provide a “flaps down” option are really providing only a flaps-down model - the kit is designed to have the flaps up, which is the correct position for any Spitfire past about 30 seconds after touchdown. A lot has been made of the provision of a “complete” engine, and cowl panels that are thin enough to allow the kit to be assembled with the engine inside, with the provision of magnets so that the panels can be displayed open or closed. In fact, what is provided is a generic Merlin engine, which cries out for detailing, since it provides none of the wires, tubes and hoses that are associated with the real thing. 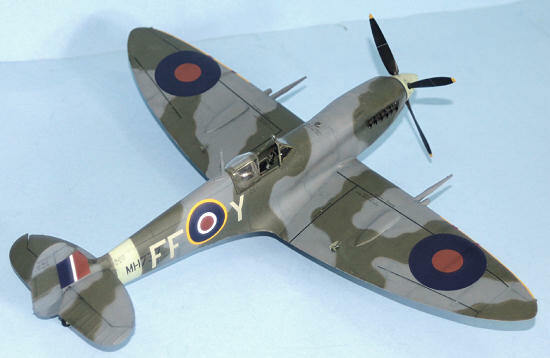 Some traditionally-thick Tamiya decals are provided with markings for the ever-popular EN398 JE-J Spitfire (they’ll probably have a category split for “JE-J Spitfires” at this year’s IPMS-USA Nats) and two others. Fortunately, the aftermarket has swung into action very quickly with the release of this kit, and there are now at least four excellent aftermarket sheets as of this review - one from Victory Models that is a scale-up of a few of the options from the 1/48 “Spitfire: Aces of the Empire” sheet, two from Xtradecals that include one sheet of Spitfire IXe aircraft that can’t be done with this kit as released (but will be there for the next release), and one from Zotz that includes markings for Spitfire XIVs that can be cond with the Hasegawa kit and the MDC resin conversion. 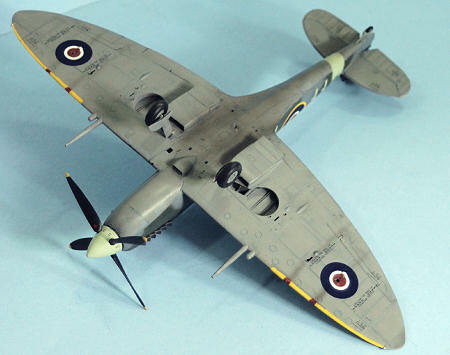 I am sure there will be a veritable plethora of decals for this model in coming months. The real skills needed to build this kit are an ability to read, understand and follow instructions, and an attention span of at least an unfettered hour at a stretch, in order to do the various subassemblies of this complex (but not complicated) model. The kit is designed so that anyone from beginner to master can assemble it without problems. There is absolutely no likelihood of misaligning the wing to the fuselage, or the horizontal stabilizer, or not getting the landing gear at the proper angles. These are all problems that have kept more than one Spitfire builder from winning awards at IPMS contests where the first thing judges do is separate the misaligned and badly-assembled models - no matter how nicely painted or decaled - from those models that will actually compete in a category. Tamiya is to be complimented for doing this, the same way Hasegawa has made the Bf-109 and Fw-190 in this scale modeler-foolproof (there’s a lot of us fools out there)in their kit design. As far as actual assembly is concerned, this is the first plastic kit I have made where I did not use any Mr. Surfacer anywhere. The kit assembles easily, and one can take care of centerline seams and leading edge seams by scraping them with an Xacto knife. I attached all the various wing panels before assembling the wing, so I could glue them in position from inside, which insured no glue smears or runs on the outer surface. All the painting instructions are accurate, and I recommend you paint everything before assembly. I used Xtracrylix paints throughout. One thing to take note of is that the kit does not show the leather padding on the back of the pilot’s seat. This can easily be scribed in. After painting the seat in Tamiya “Hull Red” - a close approximation to the color of Bakelite - I painted the leather area with Xtracrylix RLM81 Braunviolett. I assembled the very complicated instrument panel and put on the decals, but to me it didn’t really look all that good, so I substituted an Eduard photoetch Spitfire V instrument panel (even Roy Sutherland wouldn’t notice the difference if he wasn’t told ahead of time, once it’s in place and the model is closed up), which to me looks far more realistic. The kit-supplied photoetch harness is nice, but it has to be painted. 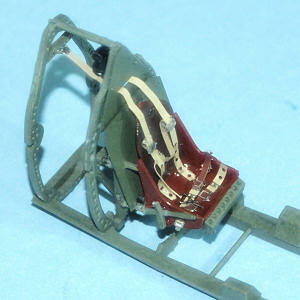 I substituted a pre-painted Eduard photoetch RAF Sutton harness set, because it was easier. I personally think the whole business with the engine and the super-thin cowling panels is a “step beyond.” It turns the model into a toy in the same way that the “visible” fuselages of the Swordfish and Me-262 kits do. The engine as supplied is just a bunch of plastic that has the shape of an engine. I personally think if one is going to display an engine - be it in a car or an airplane - you need to display an engine. By that I mean all the wires, hoses, tubes, etc. I have seen a couple of these kits where the modeler had the knowledge and took the time to scratchbuild the necessary parts to do this, and they look great. Anything else looks like a plastic toy, at least to my mind. There’s a reason why I build car models with the hood closed and airplane models with the cowling closed: I don’t like doing all that. Not only that, but the magnets should be at least doubled - one fore, one aft on each part, with corresponding magnets in the engine - to make this whole thing more than an exercise in silliness. The parts don’t stay in position with just the one magnet, and they are easily knocked off. After cramming that engine in there (it doesn’t fit as nicely as they would have you believe), I ended up gluing the panels closed. The next time I build one of these, I will assemble the internal structure - sans engine - and glue the panels at the outset. I did particularly like the subtlety of the surface detail, particularly the rivet detail, which really does look like the 1:1 Spitfires I have been next to out at Planes of Fame. I wish other companies would take a lesson here in their work. I used Xtracrylix throughout. I painted the Sky band with Xtracrylix “RAF Sky” and the wing leading edges with Xtracrylix “Trainer Yellow.” This was masked, and then the standard Spitfire “A” scheme camouflage was applied using X tracrylix “RAF Sea Grey Medium,” “RAF Ocean Grey” and “RAF Dark Green.” I unmasked this and gave the model a coat of Future. I used the kit decals for the stencils, and used the Xtradecal sheet X32-020 to do Spitfire IXc MH737/FF-Y of 132 Squadron, while I also used the national insignia on the Victory Decals sheet. (I had thought if doing a JE-J Spitfire for personal reasons, but decided I’d want to be able to pick mine out in the crowd if it was ever on public display.) FF-Y is an airplane that is well known for having been one of four Spitfire IXs photographed in formation over London by the father of aviation-photography-as-art, the incredible Charles Brown, in December 1943. The photo is so famous it has likely been re-published in every book ever done about the Spitfire. The decals went down without problem. The Victory Decals are a bit more intense in color than are the Xtradecal insignia, but other than that they are no different in terms of ultimate quality and either company’s decals can be recommended without hesitation. Final assembly included attaching the wheels to the landing gear, attaching the prop, unmasking the canopy and attaching the sliding portion in the open position, and attaching the side flap in the open position. I did not attach the “cheese-cutter” IFF wires, since those are likely to be victims of loss during display here. Should I ever take the kit to a show, I would then attach them and it is very nice of Tamiya to make their attachment position to the fuselage foolproof. 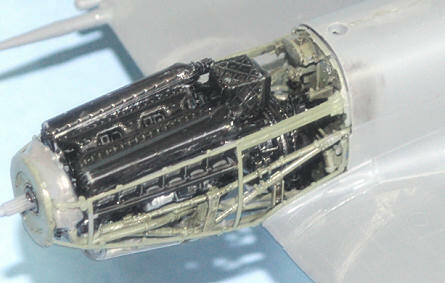 The exhausts were attached, and these are the only really truly “fiddly’ part of the entire project. Be careful when you do it to follow the instructions and get the right ones attached to the right side of the model. It’s a great kit, and it does indeed set a new standard for production design quality and ease of assembly. But to tell the truth, from a distance of three feet, you can’t tell which kit is which if you sit it next to a nicely-done PCM Spitfire IX (unless the Tamiya kit has the cowling open). Even with all the detail in the cockpit, once everything is closed up, there’s not that much more to be seen in there than is to be seen in the PCM kit. Those who bought the very nice PCM kit do not have to throw them away now that this kit is available, in order to have a very nice Spitfire IX kit on the shelf in the collection. Personally, I wish Tamiya had gone the “Hasegawa route” with a competently-designed kit that provides great basics at an affordable price (and leads to multiple kit purchases) rather than the “Trumpeter route” with all kinds of toy-like detail that really isn’t all that great, that requires a modeler to put extra effort into what’s provided if they are to create a really acceptable representation. 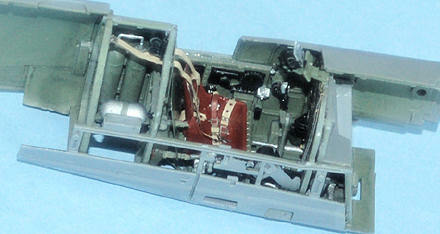 From what I see of models displayed around the internet, most modelers aren’t into opening up the engine, and for those who are, doing this as a “Hasegawa style” kit and allowing the aftermarket to create a resin engine that would have had the requisite detail to begin with, would likely have led to a cheaper model overall. (Did I mention such a decision would lead to increased sales?) Those cowling panels should have a “Look but do not touch after attachment” sign. But who am I to say? The “serious modeling geniuses” are already selling “How to Build Your Tamiya Uberkit to Our Standard” by the gross. I’m probably unworthy of this godlike model since I am such a “dog in the manger”. But I’ll still recommend it. Follow the instructions and you can’t go wrong.